Filled with some fascinating production design, fantastic visual effects and questions about the value of simulated life, there’s something strangely antiquated about this vision of the future. The long awaited film adaptation of the classic manga would have been groundbreaking 20 years ago when producer James Cameron first began thinking about it. Finally coming out after an extended detour into development hell, the Alita: Battle Angel we’ve gotten not only seems as but one of many big budget effects spectaculars of today but actually left behind by them. What’s left is a film whose themes, world building and even backend technology have been subsumed by so many other films in the interim it feels derivative even where it’s not. The end result is both earnest and artificial, just like it’s heroine. 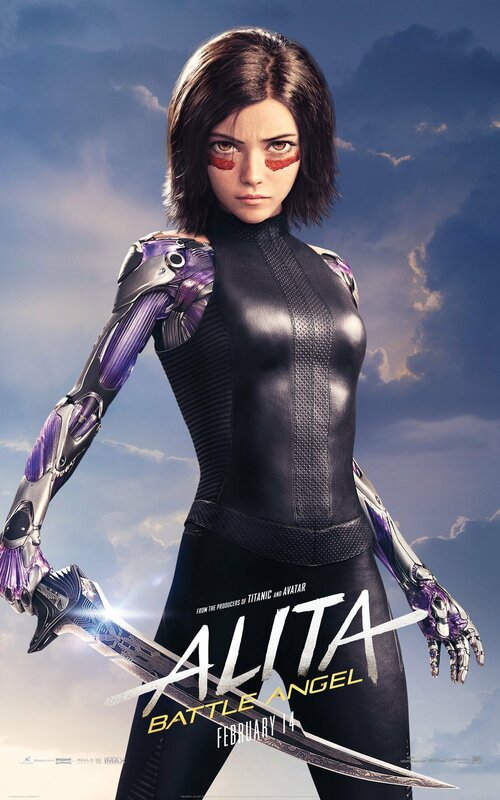 Alita herself is a cyborg, a girl whose brain has been placed inside an extremely powerful robot body by the genius cybernetisicst Dr. Dyson Ido (Waltz). Having no memory who she is or how she ended up in the junkyard of the giant floating city Zalem, Alita tries to adjust herself to life in the slums of Iron City which lives under the shadow of Zalem. Peaceful self-exploration is not to be her life, however, as local crime lord Vector (Ali) is intent on capturing her and sending her body – filled with technological secrets long thought lost – to his masters in the flying city. Suddenly thrust into a world of cyborg bounty hunters, high-octane roller derby and most amazing of all – love – Alita must decide what her new life for herself will be … before her time runs out. On its surface, Alita is (or at least should be) a fantastic piece of genre filmmaking. Alita herself is completely lifelike even with her intentionally unrealistic features. The digital work by Weta and the performance from Salazar bridges the natural uncanny valley elements, if not completely than complete enough, mostly by focusing on her heart (and not the metal one). The screenplay by producer Cameron and Laeta Kalogridis (Altered Carbon) is often clunky like a Cameron screenplay but not when it comes to the emotional life of its heroines. From her desire to find her own path to her all or nothing approach to relationships the feelings she expresses are real and they make her real. Or real enough. Combined with some of the most polished direction in Robert Rodriguez’s (Once Upon a Time in Mexico) career, the finished product is a fine example of what Hollywood does best. But if it has a big heart (and it does) the quest for its soul is a bit rockier. As slick as Rodriguez’s film is, it’s the least Rodriguez like film he’s ever made. Despite being filled with the kind of insanity which should appeal to the director of Machete – robodogs, fingers which transform into flying saw whips, a rocket propelled sledgehammer – no image or moment from Alita really breaks free. And that includes watching a torso punch someone through the eye. Perhaps it comes from being the first time years he is working within a full studio apparatus rather than being his own one-man-band composer, editor, cinematographer, product designer, caterer, etc. The requirements to produce this giant apparatus are so great he must slip into them, keep the pieces together, and be gone. And while everyone at work here clearly knows what their doing, all the hands involved have precluded a singular vision from coming forward except perhaps Salazar and Weta’s animators. In the process much of the more typical problems with these kinds of films worm their way in. As amazing as Alita can be a) she is now one more among numerous digital creations than a wunderkind of innovation and b) she takes up so much effort everything around becomes unreal as a result. Many of the other robots and cyborgs end up looking slapdash and unfinished, and the supporting humans aren’t much better off. Tagged with delivering the film’s heaping loads of exposition few of them are given the quality of role Salazar has gotten; the closest is her paramour Hugo who has unfortunately been saddled with the worst actor in the cast. The plot itself is muddled, mostly as it tries to worm its way through years of exposition from the original comics, tying to many disparate elements together to be wholly satisfying. 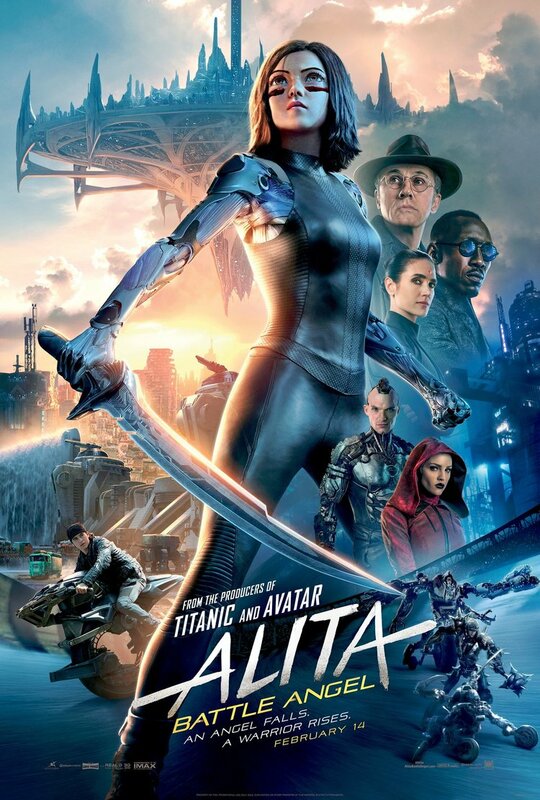 Worst of all, though, is I could have removed the words Alita from much of that and replaced it with any of dozens of similar recent tentpole fair – Mortal Engines, Jupiter Ascending, etc. – and I would have said about the same. In that sense maybe it is a real movie after all, but one whose time has come and gone. The post Alita: Battle Angel Review appeared first on ComingSoon.net.